Bertrand at Mister A’s, on the edge of downtown San Diego, offers the diner stunning views of San Diego’s downtown and Bay as well as the Coronado Bridge through sparkling floor to ceiling windows. Guests are often greeted by a plane making its final approach towards San Diego’s International Airport, but the Art Deco décor and smoothing jazz music at Bertrand at Mister A’s relaxes the diner from the hustle and bustle of the city below. Bertrand at Mister A’s believes in using only organic cuisine whenever possible. If you are looking for a meal that is both light and refreshing, then Bertrand at Mister A’s can provide you with such a dish. Chef Stéphane Voitzwinkler prepares each course with only local grown organic produce that gives the dishes a unique and energizing flavor. We began our meal with a glass of Prosecco with tiny melon pearls. This refreshing cocktail lifted our spirits with its whimsical melon pearls that seemed to dance with the Prosecco bubbles. Our Amuse Bouche was an unexpected surprise of Macaroni and Cheese, A’s Style. This pasta perfection is covered in a silky smooth Comté Cheese sauce with smoky undertones from black truffles and prosciutto. This Amuse Bouche tantalized our taste buds with anticipation of what was to come. The spring organic vegetables and spring mix lettuce from Chino Farms were tossed with champagne vinaigrette and was well paired with our Prosecco. Simply put these are the most amazing fries and are not t be missed by anyone dining at Mister A’s. These fries are imbued with a truffle taste that is sweetened by the undertone of the parmiginao regiano. Perfectly cooked, these lamb chops were paired beautifully with an olive tapenade and Fava beans sautéed in garlic butter with a bundle of organic asparagus that brought a hint of sweetness to the plate. Steamed clams and mussels accompanied by an appetizing broth that fills the mouth with a flavor both rich and sensual. Bertrand at Mister A’s is blessed with a creative and amazing Pastry Chef by the name of Amy Simpson that delighted us with her creation of a Chocolate and Peanut Butter Mousse. 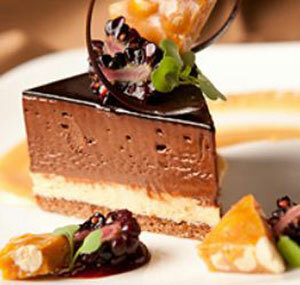 A peanut butter caramel sauce, blackberries, and blackberry jam, accompanied the Chocolate Peanut Butter Mousse that was topped with peanut brittle. The surprising mixture of chocolate, peanut butter and blackberry makes for a very exciting flavor.